Located in the east coast of Phuket facing Andaman sea, Banyan Tree Phuket is the brand’s flagship and a multi-awards winner, especially for its SPA ; it is part of the holding Laguna Resort which groups Banyan Tree Phulet, Dusi Thani Phuket, Angsana Phuket. 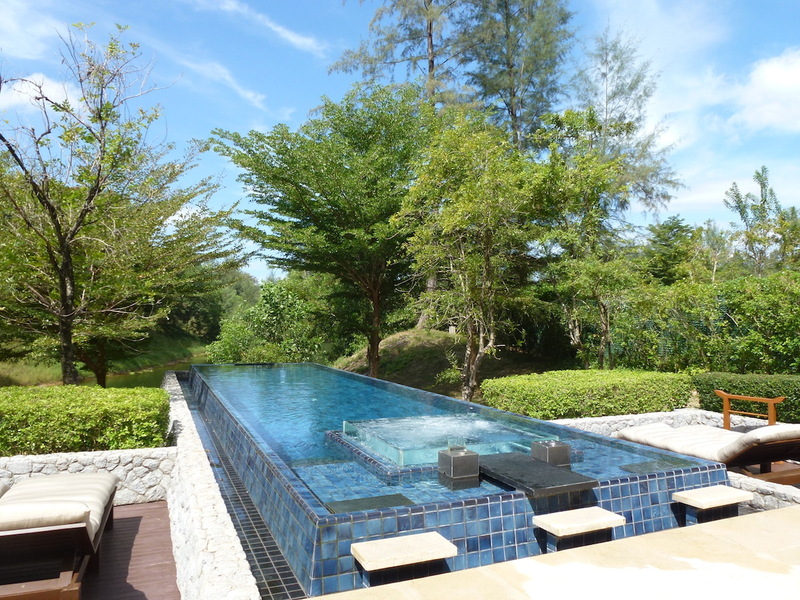 We booked a DoublePool Villa – the category you see on magazine each time they deal with BT – and it worth definitely the money. I advise to prepare everything quite a lot in advance and request a villa in front of the artificial lake otherwise they will give you a far away villa with no view. You can book also all your excursions through Laguna Resort website and can receive some discounts ; as there is limited number of places it is highly recommended ! The SPA, golf course and tennis courts are unfortunately available for all Laguna Resort guests and bring lot of people close to the lobby ; it means also that you will have to deal with these people to find a place for a SPA treatment or a time slot for tennis… It is the worst aspect of this resort, so avoid this part and enjoy it ! Banyan Tree Phuket looks like a family beach resort but all facilities are built and designed very well in a great harmony. All feel peaceful and delightful but also sportive with the 18-hole golf course and tennis courts. Definitely huge, a free boat shuttle allows you to go everywhere within 5-10 minutes thanks to Laguna Resort amenities. If you like beautiful beaches, this area of Phuket is NOT for you. The beach is far away from the resort, not pleasant at all with poor views ; moreover most of time the red flag prohibits from swimming… You should prefer some smaller resorts in crystal blue water of Phi Phi Island or Nga Bay. Simply the largest villa I booked in my life : 1000 sqm with large infinity pool, garden, open-air living-room, overwater bedroom and bathroom with jacuzzi and hammam… Just Woooow ! The pool is naturally heated and the jaccuzi inside can also heat water. So nice to swim in the morning before of after breakfast or even a midnight swim ! All interior spaces are furnished with domotic ; the bedroom placed in the middle of a swimming pool has electric curtains, direct access to bathroom. The open-air living room is not so nice as windows bring too much warmth as you can’t stay inside without being sweaty… We prefered the standard living room even if a bit small. During our stay we took only room-service food which was very nice, quite cheap although you have to wait a lot because the resort is probably too huge. The buffet breakfast at main restaurant is quite small in my view, people are queueing and waiting while there is plenty of space for seats and tables… By the way the experience is good and worth 5-star rate. When you just see pictures of BT Phuket you could say it’s a family resort and that’s it. No, definitely no, because the top notch service rises highest levels and brings this resort the finest awards year after year. If you want to find VIP service, you should book either a Spa Pool Villa or a Double Pool Villa as they have their dedicated staff. Especially, the Double Pool service is used to manage ​Peoples and Stars, they are able to answer to all your needs and introduces you upon check-in your own butler for your stay available 24h/24 with a free mobile phone. 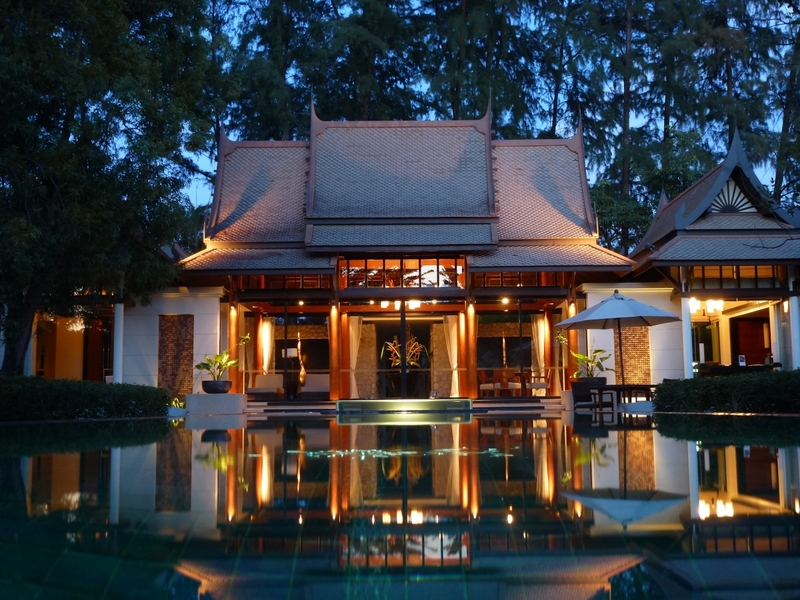 The Banyan Tree Phuket is a villa resort opened in 1995, composed of 174 villas. 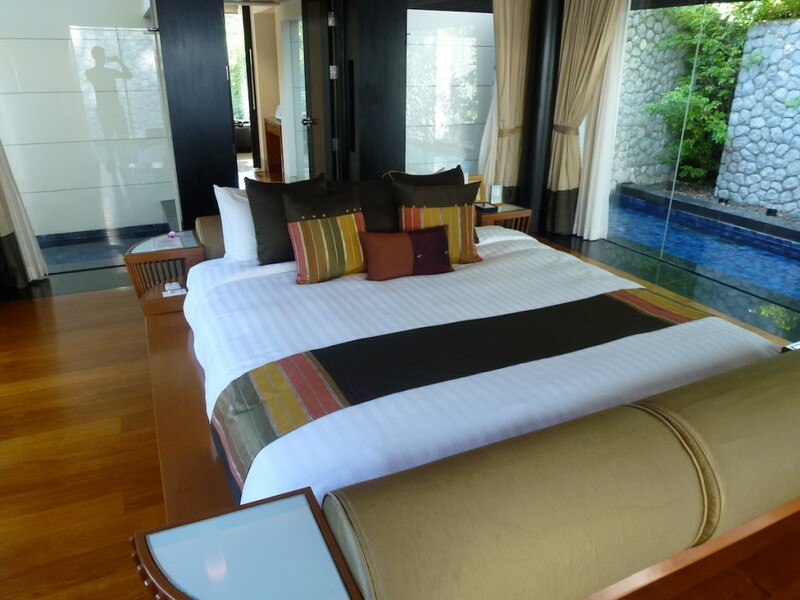 For our stay we opted for the biggest category, the DoublePool Villa with a half-price seasonal package at 600 USD/night.